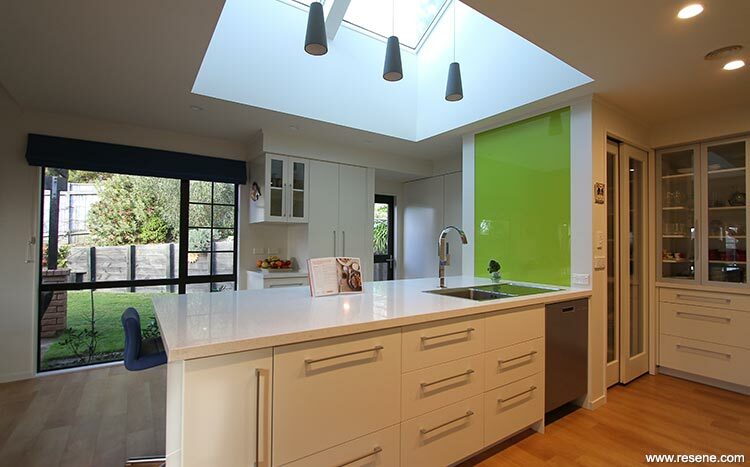 The brief was to design a new kitchen and alterations to an existing family home. 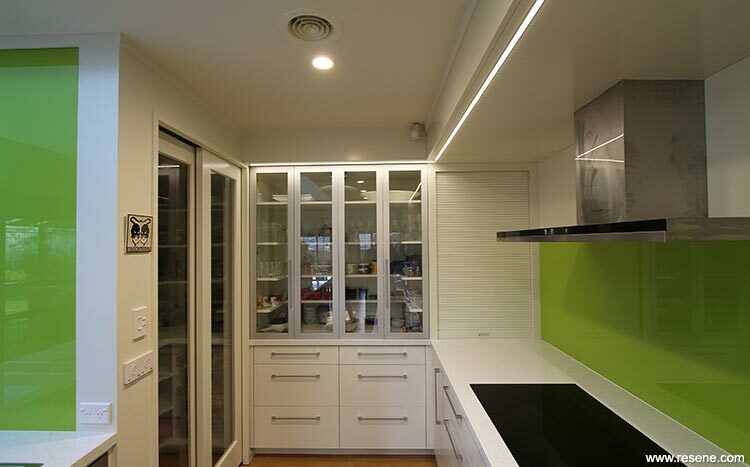 The existing kitchen area was dark and unsuitable in size for a growing family. The demolition of a large separate laundry opened up the space for an expansive kitchen, offering a large peninsula bench, generous storage and a functional relationship between spaces. Extending the existing bulkhead provided a visual frame for the kitchen to sit within. The large peninsula bench allows for multiple family members to socialise around the central bench without interfering in the functionality of the kitchen. Pivot and slide doors hide the laundry from view and a walk-in pantry located at the end of the peninsula bench allows for large bulk storage without encroaching on the open design of the kitchen. A large skylight has transformed a dark room into one that bounces light throughout the space. A feature panel was designed for the wall between the pantry and the peninsula bench as a visually exciting feature. 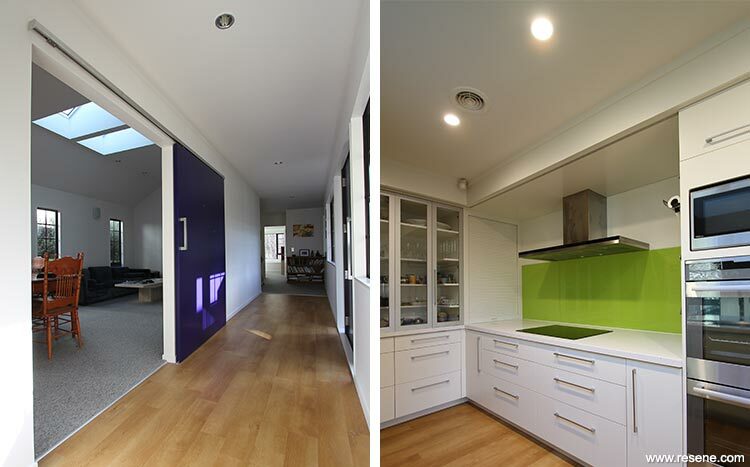 A painted glass panel was decided upon to match the painted glass splashback. Minor issues throughout the rest of the house were also addressed. It was important to clients that their main entrance into the house read as such. The existing glazed doors, which visitors often failed to read as the main entrance, were replaced with a large coloured door and sidelights. The living room was visually separated into two smaller rooms. One large sliding door was installed as part of the improvement to the living room, and highlighted as a feature of the space. The colours were selected to link the new spaces with the rest of the house, while providing bright pops of colour to accentuate features of the design. Resene White Linen was already used throughout the house and was used for the hallway and living room for consistency. The use of a single colour, Resene Double Rice Cake, for the entire kitchen provided cohesion. The finish of the kitchen cabinetry against the walls produced a subtle contrast. The design features were visually split by the use of two different bold colours. 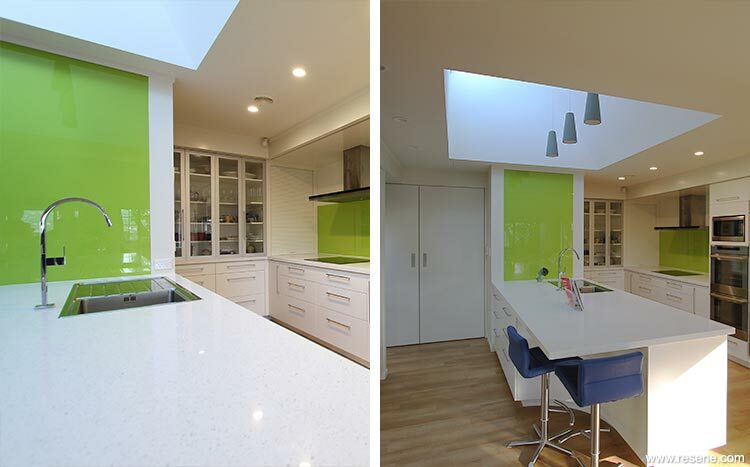 The glass splashback and feature panel reflect their surroundings, offering depth and interest. The bright colour of Resene Bahia highlights the qualities that these panels bring to the space. The bold colour of Resene Paua for the front door helps it to stand out as the main entrance. This colour is also used on the large sliding door into the living room, which can be seen through the windows when approaching the entrance.